Born in Bernard, Iowa, in 1938 Sr. Kathleen Henneberry entered the Congregation of the Humility of Mary in 1960 and made her first profession in 1963. Sr. Kathleen received her BA in elementary education from Marycrest College in Davenport, IA. She continued her education at many colleges with a focus on spiritual direction, theology, hospice care and pastoral ministry. 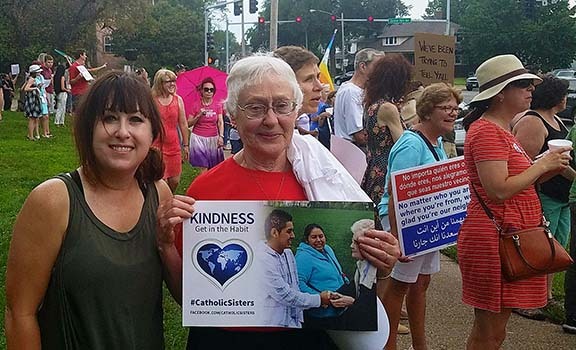 Sr.Kathleen’s teaching ministry in Iowa found her at Ottumwa Heights in Ottumwa, St. Vincent in Davenport, St. Mary in Albia, St. Mary in Centerville, St. Joseph in Dunlap, and Holy Trinity in Davenport. She also taught at St. Matthew in Sidney, MT, and St. Pius/Jordan in Rock Island, IL. Sr. Kathleen’s parish ministry found her at St. Mary/St. Joseph in Davenport, St. Louis University in St. Louis, MO, St. Catherine Church and Mercer Co. Catholic Churches in Aledo, IL, St. John Parish in Blairstown, IA, St. Mary Parish in Beardsley, MN, Sacred Heart in Oxford Junction, IA, Sacred Heart and St. James in Lost Nation and Toronto, IA, and Sacred Heart and St. Francis in Chariton and Corydon, IA. Sr. Kathleen was the coordinator for CHMs at Bishop Drumm Retirement Center from 2008-2010. After a sabbatical she was the assistant director at Our Lady of the Prairie Retreat from 2011-2013. She was a volunteer at Humility of Mary Center (HMC) from 2013-2015 while she lived at the Marycrest Senior Housing in Davenport. In 2015 she moved to HMC and became Sacristan along with Sr. Rosie Restelli. Sr. Kathleen continues with this along with volunteer driving for other CHM sisters and is active in environmentalism and social justice issues.